Time-in-Range: What’s an Achievable Goal with Diabetes? Q: “What do you think is an attainable percent time in range? My son’s doctor is happy about his A1c around 7.1%, and I think that can lead to being complacent or thinking he is good enough. What is a good goal for percent time in range on a daily basis?” – Madeline G.
Madeline – thank you for this important question! We love that you are thinking Beyond A1c. This is a big topic, so it is tackled in parts below. How do we define “time-in-range”? The diabetes research community has reached consensus that 70 mg/dl (low) and 180 mg/dl (high) are the lower and upper thresholds for measuring “time-in-range” when using CGM in studies – i.e., glucose readings between 70-180 mg/dl (3.9-10 mmol/l) are considered “in range,” while hypoglycemia is less than 70 mg/dl and hyperglycemia is above 180 mg/dl. As with anything in diabetes, however, this can be individualized. Personally, I try to aim for a tighter range of 70-140 mg/dl, in part because I have access to CGM and feel like “my best self” in this range (energy, mood, productivity, etc.). People without diabetes also typically spend most of their day in this zone, so it’s something I strive for – of course, I almost never spend 100% of any day in it. I mention this definition upfront because the person – and the circumstances surrounding that person – defines the goal. 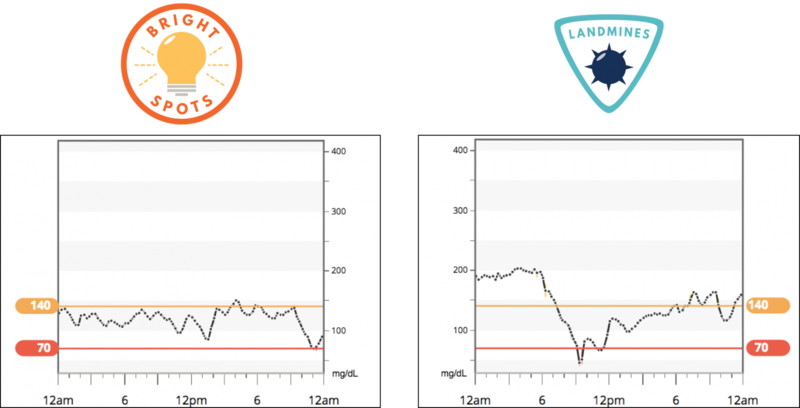 Staying in a tighter range requires more vigilance and tools, and an achievable time-in-range for a two-year old is almost certainly different from a pregnant woman or an 86 year-old with impaired hypoglycemia awareness and no access to CGM. How do I think about my own time-in-range? Do I have a specific goal? In the mindset chapter of Bright Spots & Landmines, I talk about the difference between “outcome goals” and “process goals” (pages 112-115). A time-in-range “outcome” goal might be “spend X% time-in-range each day” – it is specific, and this certainly has advantages. My approach is slightly different. I try to focus on the “process” of keeping my glucose in range each day. In other words, what key things – if I do them in the moment – will help me maximize my time-in-range? The advantage of process goals is they (i) clarify the interim steps to achieve the bigger goal; and (ii) remove many feelings of failure when unexpected things happen. 2. Try to minimize the biggest glucose disturbances and sources of error. 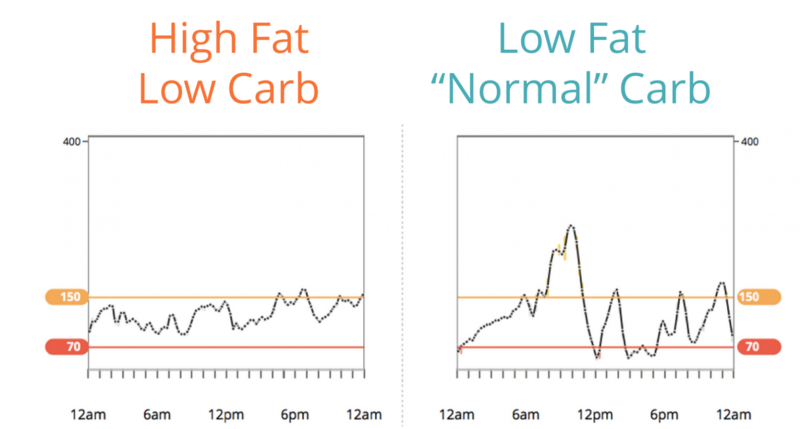 For me, the most important factor has been reducing my carbohydrate intake – it dramatically improved my time-in-range (by many hours per day), subtracted most major sources of error, AND reduced my diabetes burden at the same time. When eating meals higher in carbs (e.g., over 30 grams), taking insulin at least 20 minutes before the first bite can really improve time in range. Carbs raise blood sugar faster than injected/pumped insulin lowers it, so the insulin head start is essential for staying in range. New faster-acting insulins, Afrezza and Fiasp, might be able to help too – ask your healthcare provider. 3. Make “course corrections” when out-of-range blood sugars come up – e.g., taking a walk to correct a high, eating glucose tabs to recover from a low quickly. In other words, one of the best ways to maximize time-IN-range is to minimize time-OUT-of-range. Catching highs and lows quickly and addressing them helps do that. 4. Identify and replicate my Bright Spots – when I have a day with lots of time-in-range, what happened? How can I replicate those decisions? 5. Build routines to minimize my Landmines – when I see less time-in-range, what choices drove that? How can I avoid those decisions next time? For instance, changing up my breakfast, eating an early dinner and not snacking before bed, reducing hypoglycemia binges, getting 7 hours of sleep, etc. I encourage everyone to develop their own Bright Spots & Landmines using the book’s end-of-chapter question guides. Following these principles dramatically increases the likelihood of more time-in-range every day. Plus, it means I don’t beat myself up when I have an unexpected rollercoaster day of blood sugars. What about specific time-in-range and time-below-range goals? In the coming years, I hope experts debate these questions and reach a consensus on the goals for time-in-range, time-below-range, and time-above-range. We don’t have these goals like we do for A1c, where the aim is typically less than 7% – this A1c level is based on long-term outcomes trials like DCCT/EDIC and UKPDS. Such trials are lacking for time-in-range, meaning we don’t know what the tradeoffs are – e.g., what are the relative benefits of 50% vs. 70% vs. 90% time-in-range? How do different levels of time-in-range, below-range, and above-range link to outcomes that matter? For now, there isn’t agreement on what overall time-in-range goals should be, since everyone is so different. 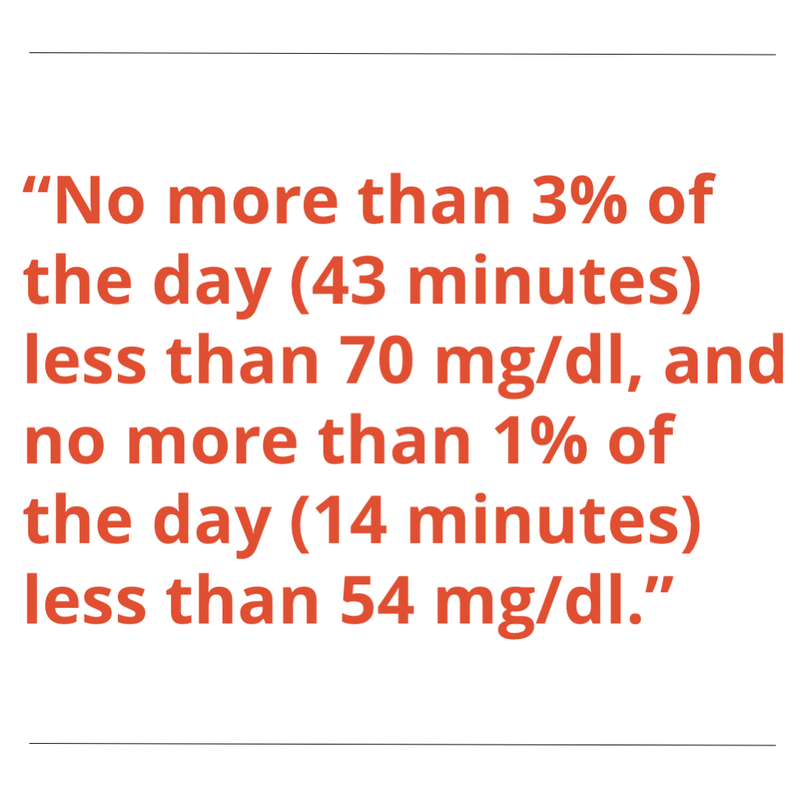 He added that good goals for hypoglycemia are “no more than 3% of the day (43 minutes) less than 70 mg/dl, and no more than 1% of the day (14 minutes) less than 54 mg/dl.” Dr. Irl Hirsch similarly recommends no more than 5% of the day less than 70 mg/dl. Other glucose metrics can work too. 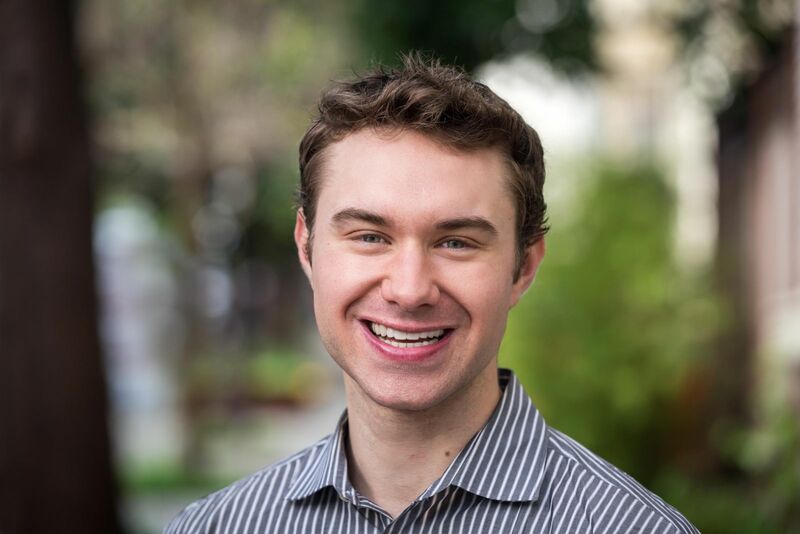 Dr. Steve Edelman likes to see an average glucose of 150 mg/dl or lower, with a standard deviation (a way to measure variance from the average) of 50 mg/dl or lower. 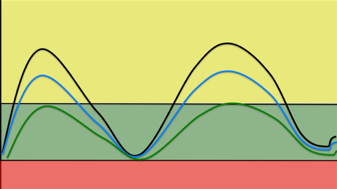 In other words, the standard deviation should ideally be less than one-third of the average glucose, indicating a tighter spread of glucose values. An advantage of this approach is it works with glucose meters too. 1. Took 3-4 fingersticks per day, meaning I had little data to learn and could not do “course corrections." 2. Ate a higher-carb diet that drove big spikes in blood glucose and required large insulin doses, with lots of resulting glucose disturbances and mistakes. 3. 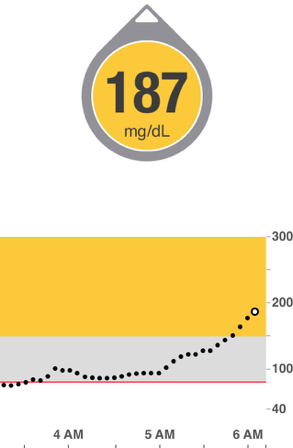 Didn’t put a lot of effort into managing my diabetes, in part because no one told me that keeping my blood sugar in range benefitted me TODAY. I didn’t wear CGM at that time (it wasn’t available), but if I had to guess, I spent roughly 50% of the day in the range of 70-180 mg/dl. Achieving significantly higher time-in-range as a teenager would have been hard without getting more glucose data (#1) and changing my eating (#2). In other words, a single “goal” might have helped me, but my choices to achieve it are really what mattered. What do I see in my own diabetes? What do recent studies show about time-in-range? In the Medtronic MiniMed 670G pivotal study, time-in-range (71-180 mg/dl) was 72% on hybrid closed loop compared to 67% during open loop. These participants had a starting A1c of 7.4%, which improved to 6.9% on the 670G. In the Dexcom DiaMonD study of injection users, time-in-range (70-180 mg/dl) was 51% with Dexcom CGM vs. 45% with fingersticks. These participants had a higher starting A1c of roughly 8.6%, which then improved to 7.7% with CGM. In the Abbott IMPACT study, time-in-range (70-180 mg/dl) was 66% with FreeStyle Libre vs. 61% with only fingersticks. This was a mix of people on injections and pumps, and importantly, they had a very low starting A1c of 6.8%. However, they were spending more than three hours per day in hypoglycemia when the study began! That’s a good example of where an A1c around 7% was not of great “quality” – there was too much hypoglycemia. In Tidepool’s Big Data Donation project, time-in-range (70-180 mg/dl) averaged 68% in the entire 354-person group, with the highest rate in 65-85-year-olds (83%) and the lowest rate in 1-5-year-olds (57%). Access to more continuous glucose data improves time-in-range relative to fingersticks. 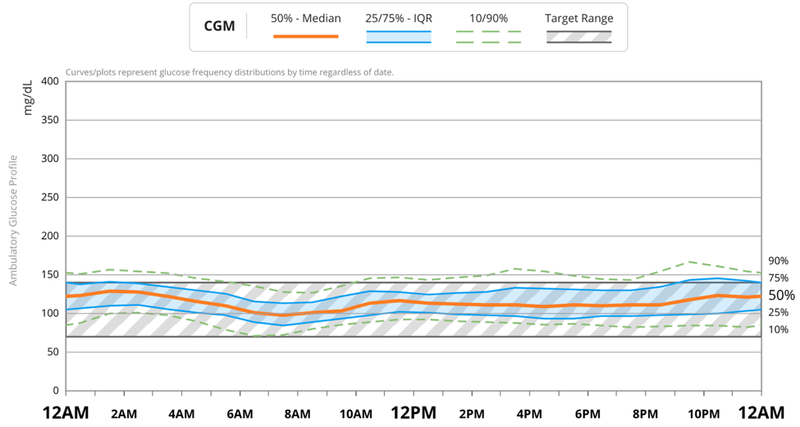 Ability to make course corrections further improves time-in-range – CGM trend arrows or use of an automated system (e.g., 670G) can help proactively avoid/limit time spent out-of-range. The population of people really matters – it’s typically harder to keep time-in-range in young children vs. adults. Do you have a time-in-range goal? Have you discussed time-in-range with your healthcare provider? Have you found a link between time-in-range and your mood, energy levels, productivity, etc.? Have you discussed time-in-range with your loved ones, especially as it relates to your mood? When you have a day with high time-in-range, what is driving that? How you can replicate those Bright Spot days? A tremendous thanks to Kelly Close, Jim Hirsch, Dr. Irl Hirsch, Dr. Steve Edelman, Dr. Roy Beck, Dr. Robert Vigersky, Dr. Satish Garg, Dr. Tim Bailey, Davida Kruger, and Dr. Howard Wolpert for providing amazing feedback on this piece. “ACTIONABLE...there are specific things you can do outlined in this book that will immediately make your blood sugars better.” – Alexis, living with diabetes and 5-star Amazon review of Bright Spots & Landmines. If you don’t have a copy yet, get it here for free or name your own price. You can also purchase it in paperback ($6), or on Kindle ($1.99). All proceeds benefit The diaTribe Foundation, a 501(c)(3) non-profit.